Large mortgage penalties are the focus of much media attention lately with people wanting to know how can they avoid this catastrophe? I am drawn to this story of Movahed whom, after finding his mortgage unaffordable, went back to his bank 3 times. 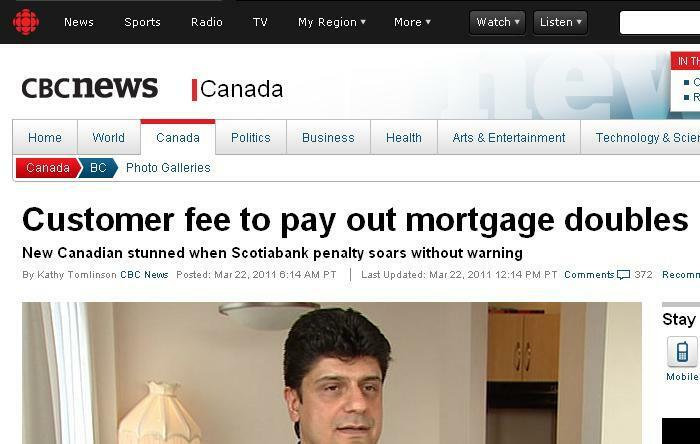 Each time his mortgage penalty increased until he finally caved in and sold the property giving up a ~$34,000 penalty. What could have gone so horribly wrong? I personally am a fan of Scotiabank. Even after this article came to light, I will continue to use their mortgages when they formulate the best combination of rate, terms and benefits to suit my client. How can this be so? Being in the industry I am fortunate to know how high penalties are calculated, when it can happen, when to avoid them altogether and when to get out before digging yourself into a bigger hole. Knowledge – Every layman does not need to become an expert overnight, but are you 100% confident you haven’t missed something? Prepayment penalties are outlined in the mortgage paperwork – if you’re not sure what it means, ask. If you’re not satisfied with the answer, ask someone else. Affordability – Be true to what you can realistically afford upfront, not after you fall in love with your dream home. Don’t forget to take into account the costs of owning and maintaining a home. Planning – Don’t try to fit yourself into the standard 5 year mortgage offered. If you have: future plans, children, downsizing, possible loss of an income etc; you might be better off taking a shorter Fixed term, or depending on risk tolerance finding a mortgage with little or no penalties. Hesitation – Bank tellers are doing their job when they read to you your mortgage penalty – but it is not their job to advise you if the penalty may continue to increase, or if it’s a good or bad idea to sell your house and cancel the mortgage (in fact it’s contrary to their business to lose your mortgage). Get professional advice, someone who can tell you if interest rates are on an uptrend, or if there are other options to renegotiate when interest rates drop or switch out your mortgage early. Next Post → Mortgage Planning to Save Your Penalty!